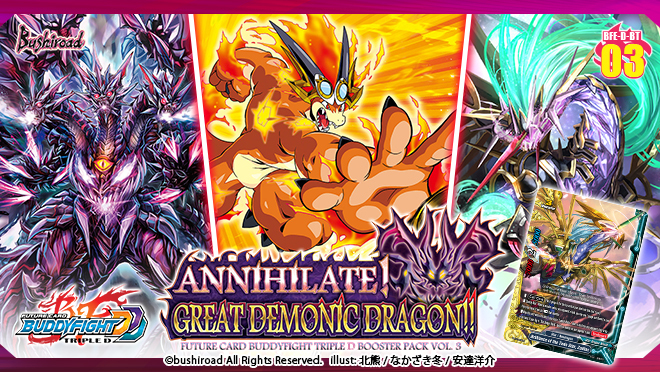 Gao and Tasuku get new impact monsters with the new booster pack BFE-D-BT03 “Annihilate! Great Demonic Dragon!!”! Meanwhile a new power awakens…!? Get ready for more sophisticated and powerful abilities coming your way within this booster set containing cards from <Dragon World>, <Danger World>, <Legend World>, <Star Dragon World>, and more cards which belong to two different worlds at the same time! 118 types of cards RRR: 8 / RR: 12 / R: 30 / U: 30 / C:30 / BR: 4 (Parallel) / SP: 4 (Parallel) + SECRET: ?? This product contains cards from <Dragon World>, <Danger World>, <Legend World>, <Star Dragon World>, and some Dual Worlds cards!!! 1 PR Flag card will be randomly inserted into each display (6 types in total)! Parallel foils of Common, Uncommon and Rare Cards are randomly inserted in packs! Receive a set of 3 PR cards for every two boxes of “BFE-D-BT03″ pre-ordered by August 19, 2016!